Bombshell by Katya Wildman: My Latest Obsession! 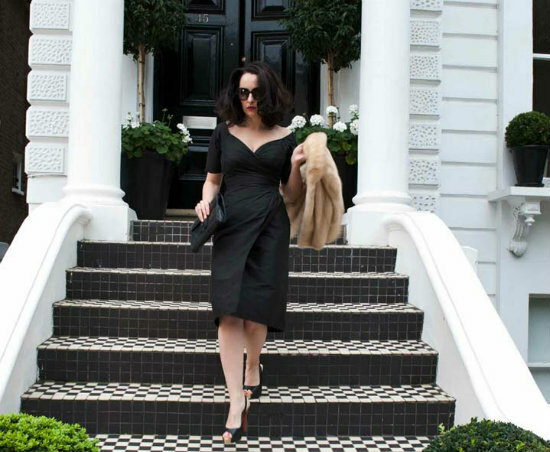 Have you heard of the Bombshell dress? I first came across it here, where the bold bird print (that's it below!) first caught my eye. I soon realised that all the Bombshell dresses shared a similar 1950s aesthetic, with a sweetheart neck line and nipped in waist, so I did a little digging. The dress was born when costume designer Katya Wildman couldn't find a dress that flattered her curves - so she designed one, complete with clever draping and secret panels. 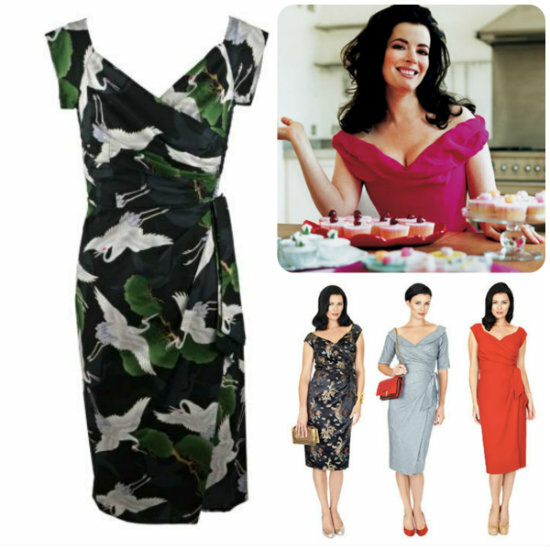 Its figure flattering ways soon amassed an army of devoted fans - Nigella Lawson chief amongst them - and the dress is now available in a wide range of prints and styles, from size 8 to 18. They all feature the signature neckline, gentle ruching and nipped in waist - and they all look to die for. I am seriously in love and have spent hours poring over the different patterns and prints online. They are pricey though, coming in at £200+, so while I'm seriously tempted to invest, I'd love to hear from someone who has first-hand experience of the brand. What do you think, are you a fan of this glamorous 50s style? The dress shape is gorgeous, I'm sure you could find a cheaper version on the high street! But would it be as flattering Adele? I want those secret panels!! The dress is such an iconic style, definitely enhances an hourglass...love it on others but wouldn't suit me. Julie, Eimear, those dresses are both beautiful! Though I don't think either would be as flattering/forgiving as the Bombshell looks...what can I say, I'm smitten! That dress looks so amazing - I want it in red! Classic black for me I think! The designer looks fab!! Oh I love the red one. They look so Mad-men kind of slinky! So pretty! I think you should invest in one! It'll never go out of style. My wedding dress had a similar neckline-it's so very flattering on everyone! I like the style, but not for myself. It doesn't suit me. I'd definitely wear this type of dress. Looks so feminine and elegant. I always thought that Nigella was wearing Vivienne Westwood dresses! LOVE these & I can imagine that the money is really worth it if the cut & shape are good. Any way you can get one sent out & return it if it doesn't look good? I'd invest in one or two - maybe we could share them haha! Such a great dress shape and so classic. Love it! Sarah, Nigella wears VW too - at least she did before she discovered Bombshell, she apparently snapped up 12 on a recent shopping trip! Amy, thanks for the link! I love the neckline of this dress! The 50's are the best! Just a fab shape for curvys! These dress Are amazing and look fabulous on and are very durable. I have a few and always get compliments when I wear them. Invest the money. You won't regret it! !